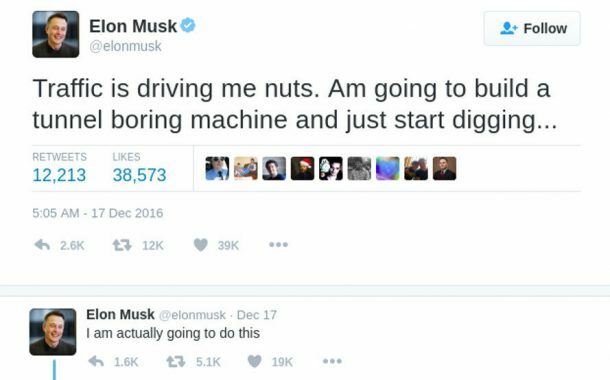 If anyone other than Elon Musk would have said it, we could laugh it off as a joke. But this is the man who is behind revolutionary things like Paypal, Tesla, SpaceX, and the Hyperloop. So when he says he’s going to build something, we have to sit up straight in our seats. And then when he saw people tweeting comments suggesting this was a good joke, he replied, ” I am actually going to do this!”. So we would not be surprised if we get to hear about revolutionising the future of transport (again) from a man who has already influenced the transport industry with his electric car, Space X and Hyperloop concept. Perhaps Musk will come up with a technology competition for this tunnel transport experiment, just like he did for the Hyperloop. What are your thoughts on Musk’s proposition? Comment below!